Steed is having a rough time navigating Tara's apartment, which is choked with fog. Members of the world disarmament committee arrive in London to face thick fog and an historic killer named the Gaslight Ghoul who picks them off one by one. It's a one-note samba that fails to stir much interest. Part of the problem is the over-enthusiastic use of dark, shadowy, foggy scenes that leave the entire episode—much like the script—impenetrably murky. Not to mention that, with several characters wearing the same "Gaslight Ghoul" costume, it's a challenge keeping track of who's who. Nothing to recommend in this one except perhaps the final sequence wherein Steed deflects a series of swordsticks hurled at his chest without so much as blinking an eye—but it's perhaps only worth it if you wake up in time. 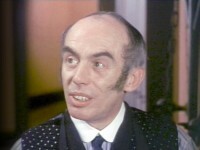 Although David Lodge appears in the credits, he never appears on screen—a victim of the editor's scissors. A short bit may be missing from this DVD. 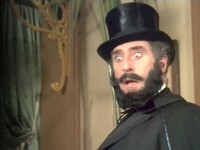 When Nigel Green is murdered, Steed says, "I'll get a doctor." Green replies, "You forget Steed, I am a doctor. You can get me an undertaker." Apparently Green's reply may have been cut (I have yet to verify this). 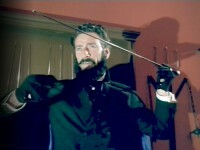 It was suggested on the Mausoleum Club Forum that the cut was made because the American audience would not understand the reference to an undertaker. Patsy Smart appeared in the Police Surgeon episode, "Lag on the Run."